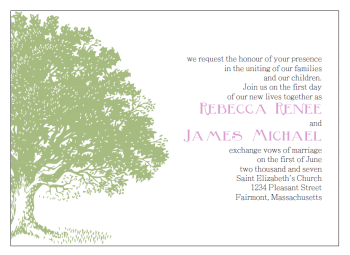 This printable wedding invitations template would be perfect for an upcoming autumn/fall wedding. I have also included a template in green for summertime weddings. I just love this image and couldn't help myself. Printable invitation kits are available in the standard size which includes the invitation, rsvp, and thank you card. Also available is our deluxe kits including everything in the standard kit with a whole lot more. The deluxe kit also offers printable STD's, enclosure cards, menu cards, programs, favor tags, water and wine labels, place cards, and table numbers. You can buy the entire set or go ala' cart and purchase only what you need. Print your own wedding invitations kits. Click on any of the thumbnail pictures below to browse our selection of invitations. 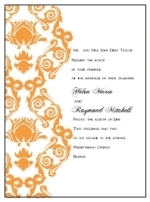 Creating invitation with our templates is simple to do. Just open the interactive PDF file on your computer. Highlight the text you wish to change and get started on customizing the wording, text color and sizes, alignment, etc. Print the invitations out onto high quality paper of your choice and then trim them to size using our handy cutting guidelines. You can use them as is or go a step further by mounting them into a pocketfold, decorative cardstock, or adding rhinestones, charms, or ribbon.